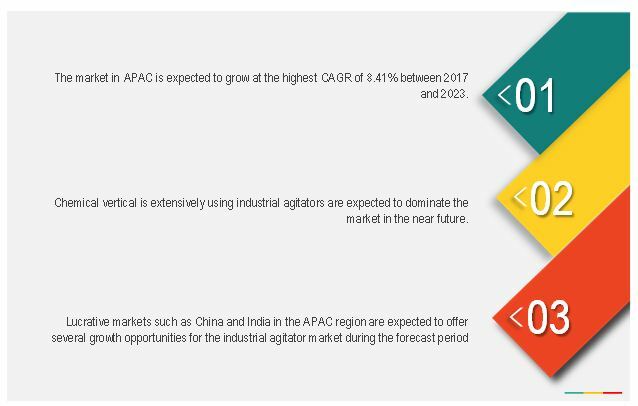 The industrial agitators market was valued at USD 2.56 billion in 2016 and is estimated to reach USD 3.86 billion by 2022, at a CAGR of 7.07% during the forecast period. With growing demand for mixing substances of varied densities with low power consumption, steadily growing manufacturing sector and process industries, and rise in demand for projects and customized agitators are driving the growth of the market for industrial agitators. The core reason for the growth of industrial agitators market is due to adoption of customized agitators. The industrial agitators are gaining traction in the market due to the increasing complexities of processing substances which in-turn is driving the demand for customized agitators. Variable power agitators are witnessing increase in the demand for the mixing applications. Many key market players are actively designing and manufacturing industrial agitators that are focused on catering the specific needs of the in-use application. Industrial agitators in the chemical industry are used to prepare, mix, and refine the liquids (chemicals). The important characteristics considered in chemical agitators include reduced process time with control over consistency and quality of the final product. The chemical applications should safeguard proper solid suspension, gas dispersion, and liquid-liquid dispersion. Most industrial chemical applications need to improve heat transfer, mass transfer, and blending, apart from solid/gas/liquid suspension. The chemical agitators are available as top entry, bottom entry, and side entry mounting types. Side entry agitators have reliable sealing systems, which can be equipped with fast device change to replace seals on a full tank. Agitators with free overhang shafts (without bottom-bearing) help reduce maintenance in the tank. Top entry agitators are designed to fit at the top of a mixing vessel; they have applications in reactors, autoclaves, and large process and storage tanks. Bottom entry agitators are designed to fit at the bottom of a mixing vessel; it is ideal for high-viscosity chemical products. The base year used for this study is 2016, and the forecast period considered is between 2017 and 2023. The industrial agitators ecosystem comprises industrial agitators-related manufacturing, technology, and service vendors such as Xylem, Inc. (U.S.), SPX Flow, Inc. (U.S.), Sulzer Ltd. (Switzerland), Philadelphia Mixing Solutions Ltd. (U.S.), Dynamix Agitators Inc. (Canada), Mixer Direct, Inc. (U.S.), Tacmina Corporation (Japan), Statiflo International Ltd. (U.K.), Ekato Holdings GmbH (Germany), and Silverson Machines Inc. (U.K.) among others, who sell these products and provides services to end users to cater to their specific requirements. “The study answers several questions for the target audiences, primarily which market segments to focus on in next two to five years for prioritizing the efforts and investments. 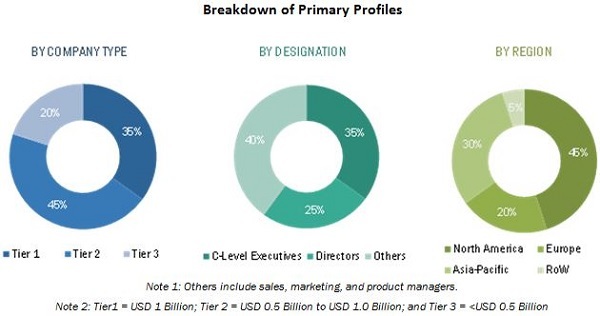 The industrial agitators market was valued at USD 2.56 billion in 2016 and is expected to reach USD 3.86 billion by 2022, at a CAGR of 7.07% during the forecast period. The growth of this market is being propelled by the increasing demand for industrial agitators especially from the chemical and pharmaceutical industry applications. Industrial agitators are used to mix several materials in the chemical, pharmaceutical, mineral, and cosmetic industries, among many others. The process of mixing involves use of powerful mechanical components that are high on performance but low on internal power consumption. The agitators are used to mix solids with liquids, liquids with gases, and liquids with liquids across a wide range of verticals. They are not only used to maintain the homogeneity of the liquids during the bulk storage but also increase the rate of heat transfer during heating or cooling process. An agitator consists of a set of components such as heads and sealing systems, among others. Agitators allow dilution, dissolution, suspension of homogenization of dispersion or emulsion of varied or similar substances to obtain the desired product. Top entry, side entry, and bottom entry industrial agitators are available in the market. Each of these is used across different industries depending on the mixing method and the type of agitator used for the agitation purpose. The global industrial agitators market has been segmented on the basis of mounting, model, mixing method, component, industry, and geography. The industrial agitators market is expected to be led by pharmaceutical industry during the forecast period. The growth of this market is being propelled by the high demand for industrial agitators for improving the operations, optimizing resource utilization, and increasing the profitability in the medicine manufacturing firms. North America held the largest size of the industrial agitators market in 2016. The leading position of North America can be attributed to the high demand for industrial agitators in this region due to the presence of a large number of manufacturing companies in various industries such as chemical, food & beverage, pharmaceuticals and so on. The growth of industrial agitators across chemical industry is a result of availability of natural gas produced from shale gases. These gases require mixing to form the desired product thereby enabling the use of agitators as the single mode of mixing. Higher production of industrial agitators due to the technological developments and product specification has made an impact on the demand for industrial agitators in the pharmaceutical industry. This is one of the major factors driving the growth of the industrial agitators market in North America region. The chemical industry dominated the industrial agitators market in terms of market size. The major factors accelerating the growth of this industry are organic chemicals like methanol, acetic acid, formaldehyde, pyridines and so on, and inorganic chemicals like sulphuric acid, nitric acid, and alkalies among others in chemical industry has led to the growth of chemical industry as there is availability of plenty raw materials. The need for high crop production in an existing land has also led to the production of pesticides which is included in the chemical segment. The chemical industry also includes oil & petroleum and water & waste water treatment segments. The varied nature of substances being processed is giving rise to the demand for customized industrial agitators. Project-specific and customized agitators are gaining traction in the market. Variable power agitators are witnessing increase in the demand for the mixing applications. Nowadays, agitators with capability of fractional horsepower (FHP) to 4,000 HP are catering to the growing demand for such agitators in the existing market. Top-mounted agitators are attached on the top of the frame or tank. These agitators can be used for mixing high-viscosity fluids. Top-mounted agitators require lesser power than side-mounted agitators and can withstand tens of thousands of hours of continuous operation. Top-mounted agitators have the largest applications in the mixing industry. Side-mounted agitators are those that are installed anywhere along the side of the mixing vessel or tank. These are mostly used for mixing low-viscosity materials across heavy-duty applications. Agitation of low-viscosity products such as oil, milk, wine, beer, and alcohol is one of the main applications of side-mounted agitators. Other applications involving the use of side-mounted agitators include crude oil storage, gasoline storage, and water treatment. Side-mounted agitators require more power but consume less blending time. Bottom-mounted agitators are those that have mountings installed at the bottom of the mixing vessel. Bottom-mounted agitators are used for both high- and low-viscosity products. These agitators are considerably lightweight than top- and side-mounted agitators. Also, no agitator influence such as weight, force, and space exists on the vessel top, and low center of gravity in the vessel allows for ease of operation. As they are mounted at the bottom of the vessel, easy demounting is also possible while using such agitators. Will the suppliers continue to explore new avenues for industrial agitators? What are the upcoming industry applications for industrial agitators? The key restraining factors for the growth of the industrial agitators market are lack of uniform standards in the industrial agitators market, and high cost of installation and maintenance. This report describes the drivers, restraints, opportunities, and challenges pertaining to the industrial agitators market. In addition, it analyzes the current scenario and forecasts the market till 2022, including the market segmentation based on mounting, model, mixing method, component, industry, and geography. 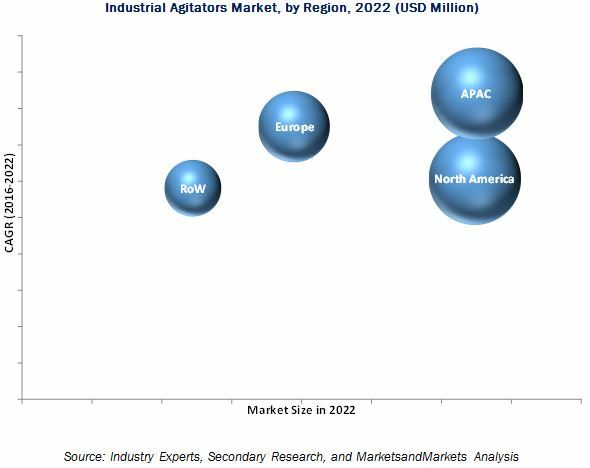 Some of the major companies operating in the industrial agitators market are Dynamix Agitators Inc. (Canada), Xylem, Inc. (U.S.), Mixer Direct, Inc. (U.S.), Sulzer Ltd. (Switzerland), and Ekato Holdings GmbH (Germany) among others. 14.6 Philadelphia Mixing Solutions Ltd.